KOAN is an interdisciplinary improvisation ensemble blending the disciplines of sound and movement since 2015. We are interested in pushing the boundaries of collective art making and traditional definitions of music and dance. Through our experimental and collaborative aesthetic we invite you to see the movement in music and hear the sounds of movement. KOAN members include accomplished musicians Erik Unsworth, Dr. Chris Reyman, Grammy-nominee Mack Goldsbury, and dancemaker Sandra Paola López Ramírez. In 2019, the ensemble will release its second CD project featuring guest artists Herb Robertson and Lou Grassi through the Polish label Fortuna Music and will tour in Germany and Poland for its release. 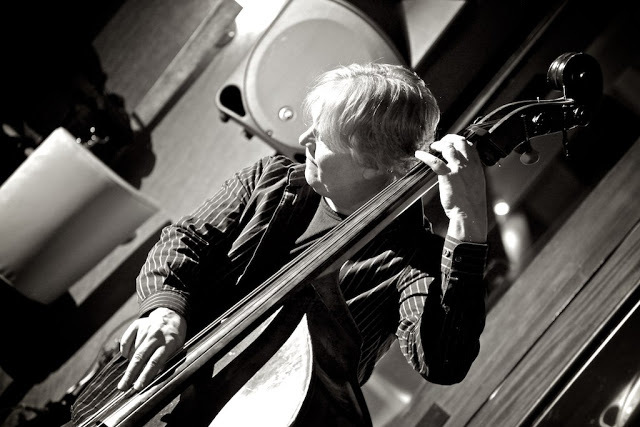 ​A native of Northern New York State and a graduate of Indiana University, Erik Unsworth has been a member of music faculty at the University of Texas at El Paso since 2003, where he has served as Professor of String Bass, Electric Bass, Jazz and Commercial Music studies. Since moving to El Paso, he has been heard supporting a wide range of world- renowned guest artists including Ernie Watts, Bobby Shew, Allan Vache, Jackie Ryan, Sean Jones, Brad Leali, Wycliffe Gordon, Al Hermann, Dave Pietro, Karrin Allyson, Tia Fuller, Maciej Fortuna, Joe Gallardo, Ray Vega, Harry Allen, Randy Sanke, Chuck Redd, Roseanna Vitro and Chip McNeill, among many others. Mr. Unsworth can be heard on a host of recent internationally-released recordings, including Dream Dances (Al Hermann and the New Impressions Trio – Summit Label), Live at CoCo’s (Mack Goldsbury Quintet – Cadence Label), and Place/Space Project for the Konnex label out of Berlin, Germany. Chris Reyman is a pianist and accordionist whose work spans jazz, commercial and experimental genres. Coming from a musical family, he began performing professionally with his father at age fifteen. He was a self- motivated student of music and developed highly versatile skills primarily through improvising at the piano. Before moving to El Paso,Texas in July 2014, Chris Reyman was a member of the Illinois- based music-dance collective Compost Q, which included world-renowned improvising dancer Kirstie Simson. Though he performs in multiple genres, his passion lies in improvisation, spontaneous collective composition and exploring the intersections between composition and improvisation. His latest project, involving grammy-nominated saxophonist Mack Goldsbury and bassist Erik Unsworth, resulted in The Red Majik, recorded in May of 2015. Chris Reyman is also a composer, educator and co-founder of in2~improv, an organization that fosters group creativity by building environments in which people can explore new ways of relating and creating through performance and collaborative improvisation. Mack Goldsbury is an award winning freelance artist with a passion for jazz. Ever since he heard his first jazz track, Mack has been inspired to follow his dreams and create the best music possible. With a career spanning through concerts, studio sessions, and soundtracks, Mack continues to push forward into whatever may come next. Mr. Goldsbury has had his fair share of awards. He has been nominated for two Grammy awards and has received recognition in numerous countries the world over. His love of travel and jazz makes him perfect both at home and abroad. When he is not busy working in the studio or performing live, Mack teaches music at The El Paso Conservatory of Music, Cathedral High School and the Charlottenburg Wilmersdorf Music School in Berlin, Germany. His love of music helps to inspire students to transcend the medium and create truly remarkable music. He thrives off of the performances of his peers, all while continuing to improve his craft daily. Sandra Paola (BFA, EdM) is a latinoamericana dancemaker, improviser and performance activist. Her community-based interdisciplinary work plays with gender, identity, and sociality, and it has taken her through the US, Colombia, Brazil, Cyprus, France, Canada and Mexico. Since moving to the United States from her native Colombia in 2004, she has studied with renowned artist such as Kirstie Simson, Ruth Zaporah, Cynthia Oliver and Jennifer Monson and has developed her art practice to integrate her creative process and her community organizing efforts. Driven by her commitment to social transformation, Sandra Paola co-founded and directs the Institute for Improvisation and Social Action (ImprovISA) – an organization empowering diverse populations to develop through performance and improvisation in the U.S.-Mexico border. In her work, she combines Social Therapeutics, Ensemble Thinking, Action Theater, contact improvisation, meditation and Latin American vernacular dances to create developmental approaches to social change and decolonization. She is currently dance faculty at the University of Texas at El Paso and is completing her MFA in Interdisciplinary Arts with a Performance Creation concentration at Goddard College.